YT083 – Is The Bass Guitar Easy? Click Here To Download The FREE Is The Bass Guitar Easy PDF! Is The Bass Guitar Easy? 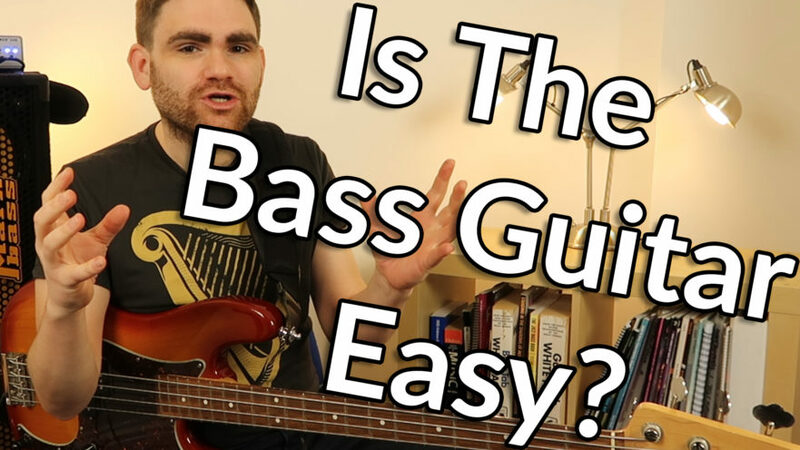 Is The Bass Guitar Easy is a question I get asked a bunch over at the eBassGuitar Facebook group especially students who are beginners or in the early phases of learning. Especially when you compare it to our friends who play the 6 string electric or acoustic guitar. They have to put complicated chords down, playing 5 or 6 notes at once on a small cramped, fingerboard. They generally have a mountain of gear and are constantly changing sounds. Play one note at a time on a bigger instrument with less stings. And on the whole don’t even get involved with complex sound changes. When I was 14 years old I had a conversation with local bass player “Dave” which changed my thinking forever on this subject. No longer was the bass player the guy who wasn’t good enough to be a guitarist. No longer was the bass player the guy who ended up playing the instrument because the band already had 4 guitarists. In a nutshell simple bass lines can be just as musically valid as the ones which are flying around. Now here’s the great thing about playing the bass… it’s an easy instrument to get going on and it’s a straightforward instrument to start playing those ‘simple’ bass lines Dave was referring to. Many bassists have ended up performing at their local jam session, join a band or being asked to play for a worship team far faster than they ever imagined… just by keeping it simple! Now in the bigger plan of things it’s important to appreciate that the bass guitar is just as hard as any other instrument to truly master. The greats will still unquestionably practise hours a day and dedicate their lives to being the best they possibly can be at the bass guitar. But the beautiful thing is the early phases of playing the instrument can be hugely rewarding… especially if you are comparing to a violin which takes about 2 years to get out of the ‘strangled cat phase’. So if you’re trying to work out if the bass guitar is for you make sure you check out the Absolute Beginners Bass Course. I’ll show how you can play a world class rock song… in just 6 weeks. You can get the course by joining the Bass Lab PLUS and starting your bass playing journey today.